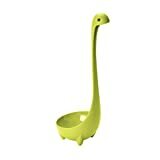 The cool new Nessie Ladle from OTOTO is no kitchen hoax. It's real! 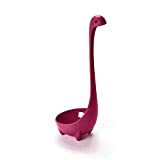 This hilarious soup ladle is shaped like the mythical Nessie creature from Loch Ness in the Scottish Highlands and looks quite convincing as a sea monster on the loose in your pot of soup, sauce, or stew. 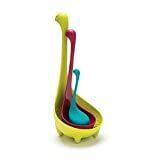 It's able to stand up on its own to complete the fun effect, which also prevents it from sliding back down into the murky depths. 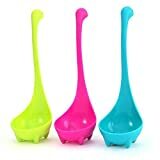 If you're going for a mythical decorative theme in your kitchen, also be sure to include this equally cool Loch Ness Monster Salt, Pepper and Oil Set as well.